Yuval has over 30 years of experience in software industries with varied roles in large scale project management, sales and marketing. Yuval truly espouses a global vision, having led initiatives for various companies, utilities and governments all over the world. Yuval is a veteran of the Israel Defense Forces’ Mamarm Computer Center. Yuval’s experience is with large international companies (DEC) as well as Israeli startups (Sapiens, ESim) serving companies as diverse as AARP, The Principal Group, Visteon, Ericsson, Airbus Industries, Nokia, ARKLA (Arkansas Louisiana Gas), Samsung and the American Bureau of Shipping. In addition to Yuval’s experience in the technology work, he has worked with numerous companies doing business development and creating unique creative opportunities in new markets and geographies. Jason Hartman: It’s my pleasure to welcome our guest today, Yuval Mor who’s coming to us from Tel Aviv, Israel. He’s got a fascinating technology with his company. He’s the CEO of Beyond Verbal. And this is a technology that analyses emotions, and you will be amazed at how this might help you give a better presentation, whether it be a public speaking presentation, or a sales presentation or getting ready to go out on a date, or convincing your valentine that your emotions and feelings are in the right place. It can also work in a business’s call center. So we’re going to talk about that today, and the incredible and very interesting science behind analyzing emotions. Yuval, welcome. How are you? Yuval Mor: Great, Jason. First of all I wanted to thank you for the opportunity to talk to your audience and discuss, like you said, this really exciting technology and the different use cases that it has, so thanks for having me. Jason Hartman: It’s quite fascinating. I remember seeing advertised a few years back, they were really popular and maybe more of a gimmick than anything else, but you tell me… these systems where you could put a little thing on your wall and it would listen to conversations in your office and analyze whether someone was telling the truth or lying, so kind of a lie detector. What can we really do in terms of analyzing someone’s emotions or intentions by just having a computer listen to their voice? Yuval Mor: So Jason, this is really important to notice here, that our technology, one of the things that we are really upfront about is that it can never be used as a lie detector, and the reason is simple. What we are listening to, what we are analyzing, is something really similar to what humans would do which is really analyzing just the tone of voice. And with this, with our kind of limbic system in the brain, we are able to tell things about what is the mood of the person? Is the person happy or distracted, is the person sad or depressed? But even for us as humans, being able to tell lie from truth is not something that we are doing usually when we are listening. Because when people decide to lie it’s a cognitive decision and our system is not built to analyze the cognitive part of the brain, but really the instinctive part. What we are doing is something that is based on over 19 years of research and over 300 thousands subjects. And the most interesting part is that on over 30 different languages what our research has found out is that the analysis that we are doing is language and culture independent. It’s the same analysis applicable to English, to French, to Hebrew, even to Japanese and so on, which is pretty fascinating when you think about it. So definitely understanding emotions and attitude, not being able to tell lie from truth. Jason Hartman: In understanding emotions, let’s talk about the categories of emotions. Say for example my company were able to hook this up and we were to analyze the conversations between my reps and the clients. How many categories are there? There are probably an infinite blend of categories and hybrids and so forth, but how many basic categories of emotions are there in terms of your software? Yuval Mor: One way to kind of get a look at what we are doing is we have an application that is available for now on iPhones and iPads. It’s called Moodies, and what you see when you activate this software is that every 10 to 15 seconds we are analyzing the tone of voice and we get three readings there: one, the first line is what we call the primary mood which is the most prevalent mood within these 10-15 seconds. The second line is the secondary moo, which is sometimes what the person is not necessarily really externalizing. These primary and secondary moods comes from combinations of over 400 different moods. And like you said, we really believe that moods are not unidimensional. You could be in love with your kids, or you could be showing love and affection towards your workplace, and it would show up as completely different emotions. Then, because it’s very granular, we also created an obstruction level which will call mood groups. And during the application we have about 21 mood groups that are maybe the more familiar things that we are thinking about. Leadership, excitement, depression, happiness, love and so on. So we have taken these over 400 detail moods and we have grouped them into higher level for people to be able more intuitively to understand. Jason Hartman: Okay, so one of the things you suggested, like I’ve got a big presentation I’m doing on Saturday and we talked about analyzing one’s mood before they give a presentation. Could be a job interview, could be a speech, could be a webinar, could be a podcast. I played around with the app and I just said I’m about to interview you before we started the interview here. And it said that I was friendly. And so I guess that was my mood. I guess that’s a good thing, to be friendly. If we know the mood we’re in after analyzing it, what does it tell us? What do we do to use that feedback, and maybe you don’t even necessarily have an opinion on this, I don’t know. But I’m going to ask the question anyway. So for example, what do we want the app to tell us before we give a presentation? Do we want it to say we’re friendly, or we’re in the leadership mode? I guess it depends on the presentation? I don’t know. What would you say? Yuval Mor: I would just give you a personal example. Last week I had a presentation to give in front of an audience of a few hundred people. It was a 4 minute presentation in the Gigaom event. And I had only 4 minutes. What I did is I could see when I was practicing and when I started the application came back with analysis such as anxiety, fear a little bit, need to fight, all these things that showed me that I wasn’t really relaxed and at ease giving the presentation. And the more I was familiar with the script, and felt a lot more comfortable then the things that came back were like you were saying, leadership, happiness, friendliness, which showed me that at that point I came across as someone who is a lot more relaxed giving the presentation. In which case, it’s one of the things that people can really notice and for sure when I’m giving a presentation like this or when I’m going to a job interview I want to sound a lot more assertive with the leadership position than with anxiety, fear, the depression, and so on. Jason Hartman: What did you do then? Obviously it’s not good to have anxiety or fear when you need to give a presentation and go speak to a group. Maybe a little bit of that is actually good because the natural reaction is it sharpens our mind and keeps us on our toes. But you don’t want too much of it, maybe just a little bit. So what did you do then to modify? I guess you tried to modify your emotions and your feelings before giving that presentation I assume. What did you do with the feedback? Yuval Mor: The thing is like this: Definitely one of the next steps after getting the analysis is the question of okay, now that I have it what do I do with this? And this is where it varies from one case to the other. For an example, when we are in a call center environment, what we have besides the analysis is also recommendations for the agent depending on the type of person that is on the other side, what should be maybe key words that they should use, and what should be the approach? What I did in my case with the presentation was exactly like you were saying, I just needed to practice more and to be a lot more relaxed. I knew that once I get this and I feel more comfortable, and I also did kind of a dress rehearsal the night before being in the place itself, knowing what I’m up against, and this helped me to sound much more confident in real time. Jason Hartman: That’s good feedback. Now, how long can you leave the application running? For example, for debriefing purposes did you leave the application running? Well your speech was very short, so how long will it run? Four minutes or an hour? Nine hours? Yuval Mor: So right now we put the limit at ten minutes. So you can run it for ten minutes and then you can also play it back. So all the recordings are being saved and you can actually play it back to see how you sounded. We can even give users the ability to vote whether they agree or disagree with the analysis, with the use of machine learning and crowd sourcing helps us improve the algorithms over time. Every segment can be for now a maximum of ten minutes. Of course when we’re working with partners that are developing their own applications this can be extended. Jason Hartman: That’s interesting because I assume over a ten minute period your emotions could change quite a bit. Yuval Mor: Yes. Yeah, absolutely. You can actually, in the example we talked about with the presentation, you can actually see because you can do the playback also, you can see if there are parts of the presentation that you feel more comfortable with versus parts that you feel less comfortable. In the context of a job interview or a sales pitch. Let’s say that when I’m talking about a job interview, maybe my last job was not something that I’m very happy about and maybe the application will tell me that when I talk about my previous job I sound more apologetic than when I’m talking about how well I did at the university. So this can help me to improve just specific parts of the interview, the story that I tell. Jason Hartman: One of the big things I think would be very helpful with this on the phone, when someone is making sales calls or giving over the phone presentations, just trying to hone their skills and be the best they can be doing this… the public speaking example is fantastic. I would love to just leave it on all day when I do this 8 hour seminar and just have it kind of analyze me in the morning when I’m bright and on and had my coffee, and in the afternoon after lunch. We take feedback from the crowd too, so that’s interesting too. But I think on the phone is a really handy area to use an application like this, right? Yuval Mor: Jason, I think some of the examples you gave there are really wonderful. I can tell you that we have one example that we are using again because it happened to us in real time. We were at CES in Las Vegas and had people kind of coming to a hospitality suite that we had and we gave presentations all throughout the day, and then at some point in the afternoon my VP or marketing gave a live demonstration and the analysis came back awful, anger and fatigue and frustration. So initially he was kind of apologetic. Maybe the software was not working and there’s a problem in the server and then he played it back and he realized that he was just tired from the whole day. What we really found out is that there is a lot of ideas that this technology can be used and that’s why we are giving access to application developers to our technology, put it in the cloud as a service and let other people that are developing applications to, if you will, emotionally power their applications. And people come back with wonderful ideas. Analyzing communication between air traffic controllers and pilots and maybe understanding where either parties may be under a lot of stress and quite a lot of ideas that are possible. Jason Hartman: Yeah, fascinating. How accurate do you think this technology is and what do you see as the future? Yuval Mor: In terms of accuracy, in the mood area we are currently at about 80%. Level of accuracy is being reported by people that are using either our iPhone application or our web application because it’s available also on our website. The self-reporting over 80% level and what we are doing is we are applying a group of psychologists that basically listen to a segment that was recorded and people agreed to the analysis. And then we are adding tagging to see that there is really a correlation between the analysis of the psychologist and the analysis of the people. Jason Hartman: Yeah but let me mention to you something about that. I find what’s known, maybe not everybody listening knows this, what’s known as the quantified self… I think it’s really fascinating and I’ve been engaging in that myself. I have been monitoring my sleep for about half a year now fairly consistently, and that has been quite insightful. It’s not perfectly accurate by any means, but I’ve been using the sleep cycle app. I’ve been doing some other things to avail myself for the quantified self movement. I was recently using time doctor to really monitor how much I was working. That was kind of enlightening. I just never really kept track of it before. I’ve never had a job – I’ve always been self-employed. No one had ever kept track of my work hours including yours truly. With the new iPhone watch version coming out, as we all think it is, there’s going to be a host of biometric data there that we can use as part of this. So what would be really fascinating is to use your technology along with all of these other quantified self things, and integrating with some sort of a journal or a diary as well. Because then we can really do some data mining in putting all of these pieces together. Integrating it with one’s calendar, the number of calls they made that day, the duration of the calls maybe, integrating it with a time software like the time doctor with a sleep app and a journal… this is going to get interesting. It really is. No thyself, right? Jason Hartman: I didn’t mention that one; of course, that’s important, yes! Yuval Mor: To measure this with the emotions, and maybe finding out that right now you are in the last day, couple of weeks, you are under pressure because of work, or things at home or things with the family. We strongly believe that this would add another level of information that can come in parallel to all of the other things that you are measuring, like the pulse and the blood pressure and so on, and really will add a fascinating level of information. Jason Hartman: It really will. The unexamined life is not worth living, as the saying goes. One other big application I can see for this. I have a well-known guest coming on the show. Her name is Nancy Duarte, and she’s written several books about public speaking and about power point presentations and so forth. She gave a TED speech that was quite interesting that I saw, that analyzed some of the most moving speeches in history, from John F Kennedy to Martin Luther King and so forth and she analyzed what is it, what can we do to crack the code of these very powerful communicators and use these techniques for ourselves to influence people and to be more powerful, and to communicate in a more outstanding way. It would be interesting to use your technology with famous speeches throughout history and see how did Martin Luther King use the highs and the lows and combine that with the idea of Joseph Campbell’s Hero’s Journey. You could analyze movies and television shows. Seinfeld, probably the best written sitcom of all time in my opinion… there’s a pattern to the way they T up those jokes obviously. There’s just tons of applications. Have you done any of that? Have you gone into history and just turned on your software and had it analyze John F Kennedy for example? Jason Hartman: Did the lie detector go off when Obama talked? 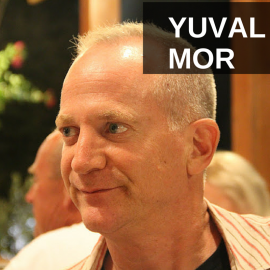 Yuval Mor: No, no. What is interesting is to be able to see how the software picked up on the sarcasm, the ridicule, the controlled anger… But like I said it wasn’t the lie detector, but you could see. We have analyzed Snowden and you could see how analytic and confident and detail oriented it comes across with the software. So some very fascinating examples of public speaking that we have done. Jason Hartman: Really very interesting. Well Yuval, this is just a fascinating technology, a fascinating discussion. The website of course is BeyondVerbal.com and I’m glad I discovered it. I can’t wait to really start using it in my pregame for my big seminar on Saturday. I’ve got to remember to use this and see my mood before I start. Maybe before I start each session, when we’re coming back from a break that’s a good time to do a little analysis. And it can be done in as quick as 20 seconds or as long as ten minutes, right? Jason Hartman: Fantastic. Anything else you want to say in closing? Jason Hartman: And at the doctor’s office, and of course the psychologist office, you know? Yuval Mor: Yes, so just additional level of information. There are some really fascinating things that can be done with this. Jason Hartman: Well the future is really interesting and very exciting, but a little scary at the same time. I think it would be fair to say both sides of the coin, right? Jason Hartman: Beyondverbal.com. Yuval Mor thank you so much for joining us today. Yuval Mor: Thanks a lot Jason and I’ll be happy to hear any feedback that you might have. Thank you.